Composite materials are progressively replacing aluminum and other metal alloys in commercial airplanes. Weight-saving is the principal reason for this move to composites as lighter planes mean reduced operating costs. There is also lower maintenance with composites, which demonstrate better fatigue performance and no corrosion. 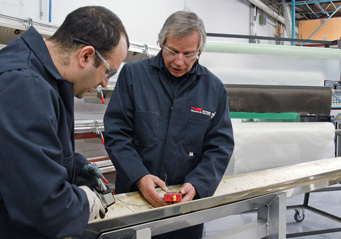 Norduyn has also developed unique technologies for the manufacturing of its own composite panels using our proprietary multiple layer composite laminating roller which can produce long single sheets through heat lamination. The panels produced are used mainly for the military aviation and transportation markets and are made of polypropylene reinforced with fiberglass, which makes them extremely resistant to impact and abuse. 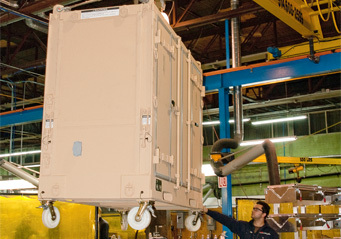 Our manufacturing technology is clean, fast and efficient. Norduyn is supporting the industry in defining new applications for composites to meet the requirements of its markets. 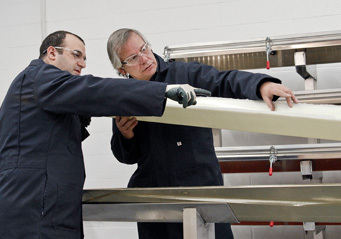 Our capabilities in composite applications are developed through our innovation programs and collaboration with customers, materials and equipment providers, as well as universities and research institutes.